Motley Blocks (Free) takes little voxel statues and blows them into pieces. They probably didn’t deserve it. They probably didn’t know what hit them. Now they’re scattered to bits, and you need to put them back together. It’s a set up for a matching game, but not quite the usual one. 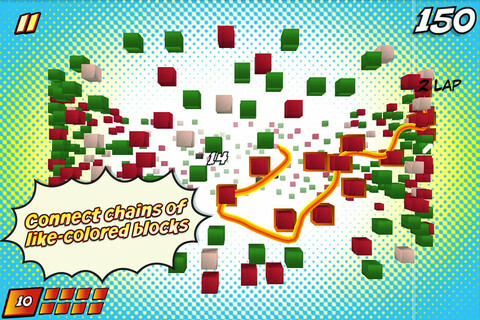 Blocks of many colors fly around the screen, doing laps beneath your fingertips. You trace your way through the ones that match, scooping them up so they can be rebuilt. One or two passes are all you have to put what’s broken apart back together again. The fun isn’t so much in the matching – it’s line drawing with a side of frustration whenever you bump into the wrong color and your combo falls apart. No, the time limit is where the magic happens. After you get beyond the first few, simple levels, there never seems to be quite enough time to clear every single color before that finish line appears on the horizon. It’s frantic, but takes extreme control. The distance between those things keeps the game interesting. When you finish a level, you get to see what you’ve built. It may be an ice cream sundae or it may be a dragon – it’s nice to know which. It’s far nicer to know where you rank, because that’s when Motley Blocks goes from acceptably fun to dangerously competitive. At the end of every week, your scores are tallied up. If you manage to stay in the top 10 of any levels, you’ll be well rewarded with piles and piles of blocks. The entire game runs on blocks, so a good win is saving you the cost of buying them or the time of earning them level by level. Each day has a single challenge level with similar rewards. I don’t mind telling you that I spent the last hours of Sunday night making sure I was securely in the top 10 of as many levels as I could manage. My reward ended up delayed a few days (a kink that’s hopefully been worked out now), but there’s something immensely satisfying about logging into a game and being given a huge pile of currency as a reward for playing well. The blocks went right back into the game. There are quite a few levels to begin with, and a few more packs that can be bought with your winnings. It also costs blocks to use power-ups, and those power-ups can make a pretty big difference in your final score. 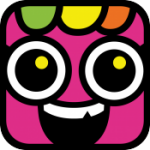 It costs blocks to play through user-generated levels (a strange choice, since those could be a huge selling point), and blocks to buy colors with which to make those levels. It even costs blocks to publish larger designs. Your best bet is to forget there are blocks for sale. The IAP prices are steep, and going that route saps a lot of the entertainment out of the game. Better by far to fight for every block, even if that does drag things out into the long game. You should be able to keep yourself in power-ups with what you can grind. Everything else you’ll have to earn the hard way, and that’s the way it should be. Motley Blocks is a fun little matching game. It lets you create, destroy, and rebuild, all with a tap or a swipe of your finger. It’s also intensely competitive, if you’re into that sort of thing. Pulling the perfect combo into the perfect power-up to blow your score out of the water and into the top 10—that’s good stuff. Good enough to make me think about doing it all over again this week for another shot at that leaderboard glory.